admin – Welcome to The Friends of Scusset Beach Reservation, Inc.
Join the Friends for a fun weekend of Safari Filed camping. Click on the date you want to attend to download the registration form. Organized the group, established bylaws, officers, non profit status, and a web site. Developed and started selling Scusset beach stickers as a fund raiser. Took part in our first park serve day. Awarded our first DCR matching funds partnership grant to purchase the materials for a new boardwalk. Constructed a new, ADA compliant boardwalk from the jetty parking lot to the canal service road and held a dedication for same. Held a series of pancake breakfasts as well as continuing selling Scusset stickers as fund raisers. Awarded our 2nd DCR partnership grant towards materials for a new campground path. Constructed a new ADA compliant pathway from the bath house to the beach parking lot in the campground to improve access. Established a friends group face book page. Held a fall pancake breakfast as well as continuing selling Scusset stickers as fund raisers. Awarded 3rd DCR partnership grant for improvements to exterior of Beach bath houses. Purchased painting supplies and landscape materials as well as labor for landscaping at the Beach Bath houses. Provided a thank you party for Student Conservation Association workers who installed new lumber at safari field. Vice President Paul Loiselle chosen Volunteer or the year and Supervisor DeCosta as DCR friend of the year by the statewide friends group network. Organized first Friends Group Safari Campout. Provided refreshments to DCR staff from several parks who help to build new boardwalk. President Elise Smith and her husband Rick chosen as volunteers of the year by the statewide Friends Group network. Held a Family Fun Day event in connection with the Cape Cod Canal’s 100th anniversary celebration. Provided labor and equipment for the installation of new rail fence in the playground, fire pit and work yard areas. Added baseball caps and post cards to fund raising merchandise. Help a spring fishing derby. 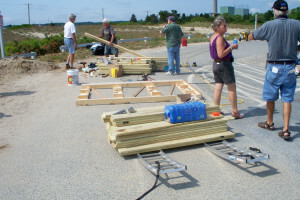 Due to the campground being under construction and closed for a new Electrical Systems, the Friends of Scusset missed doing two of their “Friends Fundraisers”. The campground section of the Reservation did not open until July. The Fish Pier and the beach areas were opened as scheduled. The Friends purchased two benches for outside the office area which have been installed. These benches will be dedicated to the memory of “Norma Cotter” who did the “Friends” Web Page and Newsletter. She was also the DCR Employee who greeted you in the office. Norma will be missed by all. The Friends also purchased a bench dedicated to the memory of “Tom McSweeney” an avid supporter of Scusset Beach. This bench will be installed at the beach at the end of the boardwalk. The bench was purchased with funds from donations made in Mr. McSweeney’s name to the Friends of Scusset Beach. Also requested by the family, another bench for the playground in memory of Mr. McSweeney’s and a Doggie Waste Station for the playground. Due to the death of Friends member Paul Porazzo (husband of Treasurer, Linda) a fund was set up to purchase a bench or benches within the campground section of the park. These are ordered and will be placed within the campground this year and also funds available for “Doggie Waste Stations”. The Friends also purchased for the Park Supervisor two Echo Weed Trimmers, a Welding Tank for use within the Reservation. The Beach Building has been painted with the help of laborers from the prison, and work on the roof has been completed. 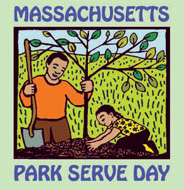 Assist park staff with beautification and painting projects in the spring. Purchase much needed equipment for the park as requested by the supervisor as funds are available. Some of these items include a drill press, screw gun, power cut off miter saw, back leaf blower, power pole saw, letter boards, and vehicle PA system. 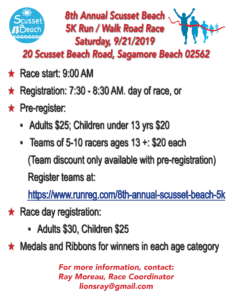 The Friends of Scusset Beach is a non profit organization that is organized to promote and conserve the natural, scenic and historic resources of Scusset Beach State Reservation. We are here to assist the Commonwealth of Massachusetts in the operation of Scusset Beach Reservation; and to assist and work in cooperation with the Park Supervisor, Forest Supervisor and Army Corp. Engineers in general support and enrichment of Scusset Beach State Reservation. The group was organized in September 2009 and has undertaken several fund raising and work projects to help improve the reservation. We presently have over 200 members of all ages and from as far away as Florida. Our members come from many different walks and enjoy the Reservation in a variety of ways like camping, fishing, bike riding or going the beach for the day. 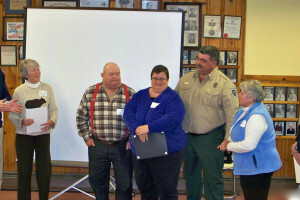 What we all have in common is that we enjoy Scusset Beach State Reservation and support the friend’s organization in a variety of ways as a means to improving the park. With over a half mile of some of the sandiest beach on Cape Cod and rolling dunes, Scusset’s day use beach, located on Cape Cod Bay, is a very popular destination in the summertime. The beach is great for sun bathing, swimming, surf casting (in designated areas), walking to the stone jetty, metal detecting or ship watching. 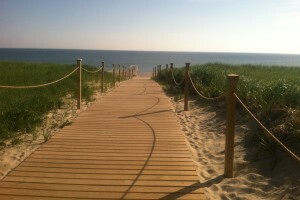 A new ADA compliant boardwalk allows easy access to the beach. In season, late June through Labor Day, There are lifeguards on duty, a concession stand and restrooms with showers for the public. Beach wheel chairs are also available and it is suggested you call the office ahead of time to make reservations. Due to the yearly arrival of the piping plover, an endangered bird, pets are not allowed on the beach from April 1st to September 15th each year. However, they are allowed the rest of the year and the beach is a popular place for dog walkers in the off season. Kite flying is also not allowed for the same time period. Please remember that alcohol and flotation devices are not allowed for everyone’s safety. 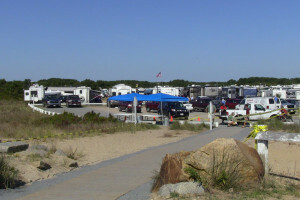 Scusset Beach State Reservation, located on Cape Cod Bay at the east end of the Cape Cod Canal, is a very popular swimming fishing, and camping area operated by the Massachusetts Department of Conservation and Recreation. One of the best areas in Massachusetts for fun in the sun, it is a wonderful place to visit for day outings and camping during the summer months, and weekend camping is even offered off-season. Boardwalks over the dunes make the beach and jetty handicap accessible. Handicap wheelchairs are available for beach use. Please call and reserve ahead. A beach bathhouse and concession open during the summer season. A campground with 98 RV sites, 5 tent sites, and a Safari Field for camping clubs. Park Interpreter’s programs available to all at the Nature Center and other areas of the park. Swimming on Scusset’s sandy beach. Walking, biking, hiking along the paved 7-mile Canal Access road from the East end at Scusset Beach to the Rail Road bridge at the West end. Watching the boats of many varieties on this canal waterway between Cape Cod Bay and Buzzard’s Bay. The Fish Pier is not only a great place to fish but also an excellent spot to watch the Canal traffic. Family picnics and outings are often held in the shady picnic area, where charcoal grills are available for cooking. Restrooms are available in this area. 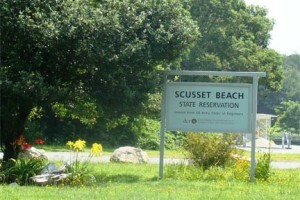 Scusset Beach State Reservation offers one of the most popular campgrounds in the Massachusetts State Park system. There are 98 RV sites, 5 tents and a rally field for organized groups. Scusset’s RV sites offer a blacktop pad, Picnic table, Individual electric hookups (20-30 & 50 amps per site) and shared water hookups. Sorry, propane fire pits only are allowed on RV sites. Scusset’s 5 tent sites are private, with a picnic table and fire pit for cooking. The Safari Field is available weekends during the summer and is for rally camping only. Please contact the park for questions about the Safari area. The campground has a central comfort station with free showers and an outside dish washing station and recycling area. 4 Dumpsters are located through out the campground for campers use. A community fire pit and horseshoe pits are located near the campground entrance. The parks Nature center and nature programs are available in Late June, July and August. As the campground is extremely popular, Reservations through Reserve America are strongly recommended.